In Mesoamerican folk religion, a nagual or nahual (both pronounced [na'wal]) is a human being who has the power to transform, shapeshift beyond the premisses of the human form; most often believed to be an animal form. There is a widespread superstition that in order to become a nagual you have to do a pact with the devil and offer him something really special. Such a nagual is believed to use their powers for good or evil according to their personality. Specific beliefs vary, but the general concept of nagualism is pan-Mesoamerican. Nagualism is linked with pre-Columbian shamanistic practices through Preclassic Olmec depictions which are interpreted as human beings transforming themselves into animals. The system is linked with the Mesoamerican calendrical system, used for divination rituals. The birth date often determines if a person will be a nagual. Mesoamerican belief in tonalism, wherein every person has an animal counterpart to which his life force is linked, is also part of the definition of nagualism. In English the word is often translated as "transforming witch", but translations without the negative connotations of the word witch would be "transforming trickster" or "shape shifter". A pre-Columbian Chatino stela possibly depicting a nagual transforming into a jaguar. His name is inscribed in Zapotec glyphs on his abdomen and translates to "5 Alligator". The word nagual derives from the Nahuatl word nahuālli [naˈwaːlːi], an indigenous religious practitioner, identified by the Spanish as a 'magician'. The nagual is acquired along with the other characteristics of a person's birth day at birth. Each day is associated with an animal which has strong and weak aspects. A person born on "The Dog Day" would have both strong and weak 'Dog' aspects. 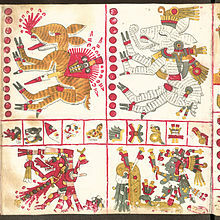 In Nahuatl the word tonalli was used to refer both to a day and to the animal associated with that day. The nagual is different, where the tonal is the day spirit proper, the nagual is the spirit familiar of the day. It is probable that the tonal represents the daytime aspect and the nagual the nighttime aspect of the tonalli, 'the things of the day'. Because practitioners of powerful magic were normally born on certain days related to animals with a strong or harmful aspect they would often have specific tonals such as the jaguar or puma. In Aztec mythology the God Tezcatlipoca was the protector of nagualism, because his tonal was the jaguar and he governed the distribution of wealth. In modern rural Mexico, nagual is sometimes synonymous with brujo ("wizard"): one who is able to shapeshift into an animal at night, (normally into a dog, owl, bat, a big wolf, or turkey) drink blood from human victims, steal property, cause disease, and the like. In other communities the accusation of nagualism may result in violent attacks by the community towards the accused. The Western study of Nagualism was initiated by archaeologist, linguist and ethnologist Daniel Garrison Brinton who published Nagualism: A Study in Native-American Folklore and History, which chronicled historical interpretations of the word and those who practiced Nagualism in Mexico in 1894. He identified various beliefs associated with nagualism in some modern Mexican communities such as the Mixe, the Nahua, the Zapotec and the Mixtec. Subsequently, many studies have described Nagualism in different Mesoamerican cultures such as the Zoques and the Jakaltek, K'iche', Q'eqchi', and Tzeltal Maya. Among the Jacaltec, naguals reinforce indigenism by punishing those who collaborate with non-indigenous 'ladinos. In 1955, Gustavo Correa, suggested Nagualism is not pre-Columbian, arguing that it was wholly imported from Europe, where he compared it to the medieval belief in werewolves. However, shapeshifting folklore is far from limited to Europe, nor is it limited to the Middle Ages; for example, some of earth's oldest literature, the Bronze Age Eastern Semitic Epic of Gilgamesh, and East Asia's Huli Jing (origin of this folklore is of unknown date, but eighteenth century at the latest; see main article), contain shapeshifters. The werewolf (lycanthropy) is also far from the only, or the earliest, form of folklorical therianthropy (shapeshifting from human to animal, or vice versa). Kaplan concludes that, in Oaxaca, the belief in naguals as evil shape shifting witches is common in both indigenous and mestizo populations. According to Kaplan, the belief in animal spirit companions is exclusively indigenous. These is certain for some groups and communities, but for others, as the Mixes, Chinantecos, Triquis or Tacuates, those who can control their nahual or alterego are also protectors of the people and the natural resources and culture of the community, and highly revered but also feared. in 1887, Sargeant Oscar Francisco Gimenez[dead link] Nava was found to be one of this witches, some villagers says they saw him transfrom into a wolf they chased after him but witness say he was way too fast to overrun him and he escaped. The term nagual was popularized in books by author Carlos Castaneda, although he had come up with a different meaning for the term, with very little relation to the Nahuatl definition. ^ a b Nutini & Roberts 1993, p. 43. ^ a b c Stratmeyer & Stratmeyer 1977. ^ a b Kaplan 1956. Brinton, Daniel G. (1894). Nagualism: A Study in Native American Folk-lore and History. Philadelphia: MacCalla & Company, Printers. Correa, Gustavo (1955). "El espiritu del mal en Guatemala". Nativism and Syncretism. Tulane University: Middle American Research Institute Publications. 19: 37–104. Hoag Mulryan, Lenore (1996). Nagual in the Garden: Fantastic Animals in Mexican Ceramics. Los Angeles: Fowler Museum. ISBN 978-0-930741-49-5. Kaplan, Lucille (1956). "Tonal and Nagual in Coastal Oaxaca". Journal of American Folklore. 69: 363–368. Nutini, Hugo G.; Roberts, John M. (1993). Bloodsucking Witchcraft: An Epistemological Study of Anthropomorphic Supernaturalism in Rural Tlaxcala. Tucson: Arizona University Press. ISBN 0-8165-1197-7. This page was last edited on 4 April 2019, at 19:34 (UTC).